As we near the end of the World War I centennial commemorations, I find myself thinking of Clair Wilbur Welty, who, towards the end of the war, was a 28-year-old pilot-trainer in the U.S. Army Signal Corps at Issoudun, France. The certificate includes Welty’s physical description: brown hair, brown eyes, 180 pounds, 5 foot 10 and 3/4 inches tall (not 5’10” mind you, 5-foot-10-and-three-quarters). He had a scar on the end of the fourth finger of his right hand. I wonder how he got that? We’ll probably never know, but there was a story there. There’s a fingerprint of his right index finger. And a photograph. If you needed any further convincing that this was a real person who lived and died – there’s a photograph. Look at his eyes, his expression. I wonder what he’s thinking? I don’t have time for this; I have things to do. Or What have I gotten myself into? Or I wonder what they’ve got at the mess hall for lunch today? So, the above document contains a snapshot (both literally and figuratively) of Clair Welty. Clair Wilbur Welty was born October 15, 1890, to A. J. and Mary Welty. He lived in Apple Creek, Ohio, located near Wooster in the northeastern part of the state. Welty attended grade school and high school in his home community, graduating from Apple Creek High School in 1905. He left for a brief period to attend the College of Wooster, then returned to teach in his old school district. In October 1917, Welty enlisted in the United States Army Signal Corps. This was an unusual action for someone who was raised Mennonite, as Welty had been. He was trained as an airplane pilot at Ohio State University. 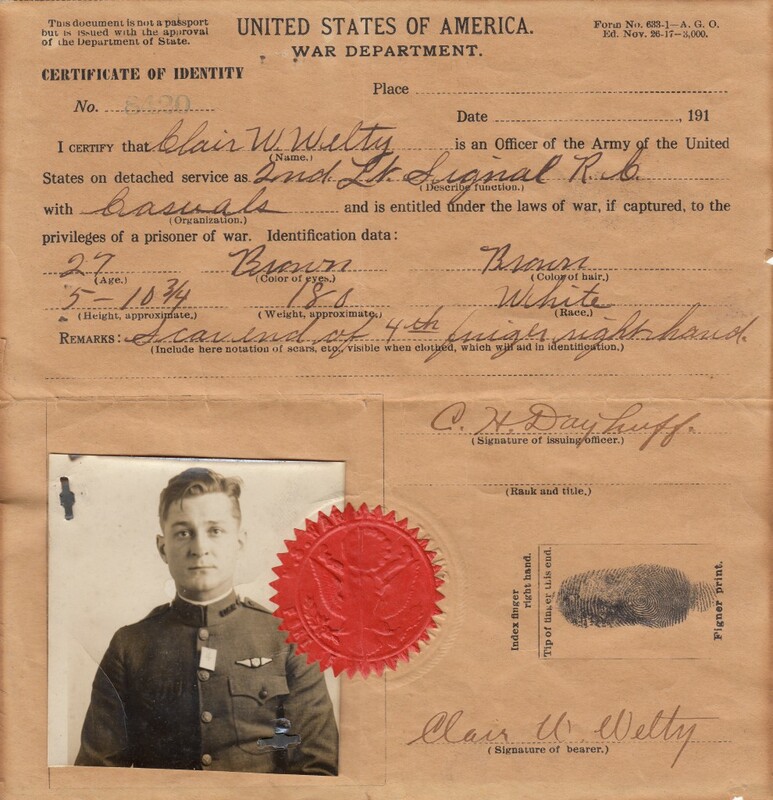 Upon the completion of his training in November 1917, Welty was commissioned Second Lieutenant. After additional training in California, Welty was sent to France as part of a group of commissioned flying officers. After he recovered from a brief period of illness, Welty was ordered to Issoudun, France, where he served as a pilot-trainer. On November 10, 1918, the day before World War I ended, another pilot’s plane crashed into Welty’s Nieuport 28 during a routine training flight. The details appear to have been glossed over in several of the letters which were later sent to his mother, but it is obvious that Clair Welty survived the crash for only a short period of time and died the same day. He was buried the following day, November 11, Armistice Day, in AEF Cemetery 32, Issoudun, France. Welty was later re-interred in Apple Creek Cemetery, in his hometown, two years later on November 11, 1920. One day. He missed surviving the war by one day. Does that make his death any better, worse, or more important than that of the other 17 million who died in World War I? Well, no. Was Welty any more or less real than any of those other people? Of course not. But to talk about casualties numbering in the millions is to discuss statistics that are so mindbogglingly big that they start to lose some of their meaning and impact. You lose sight of the trees on account of talking about them collectively as a forest. But without the individual trees, you would have no forest. It’s important to remember that every one of those “trees” had a name, a face, and a story. And most of those stories, like Welty’s, should have had a lot more pages. Our logical minds know that the numbers represent real people. But actually seeing their names and faces and hearing their stories is what makes everything “click.” We’re not just talking about 1 out of 17 million. We’re talking about Clair W. Welty, a 28-year-old pilot trainer, from Apple Creek, Ohio. Every item in the archives has a story to tell, a story that brings a piece of history to life. This particular item helps tell the story of Clair W. Welty, which in turn helps to tell the story of World War I. This entry was posted in Aviation, Collections and tagged aviation, aviation history, MS-196, World War I, WWI. Bookmark the permalink.